One of my most popular photos (as well as one of my own personal favorites) is this one of a colorful street in Providence, Rhode Island. It’s just across the street from a historic Baptist church. I think the vivid colors combine with the downward slope to create interest and dynamism. Someone once criticized the fact that there were people in the photo but hey, you know what? Providence isn’t a ghost town! It’s a state capital! People live there! I did desaturate the man’s shirt somewhat so that the bright red wouldn’t draw unnecessary attention to him, but removing the people seemed an unnecessarily pedantic move. As I said, the colors are obviously one of the image’s strongest features. 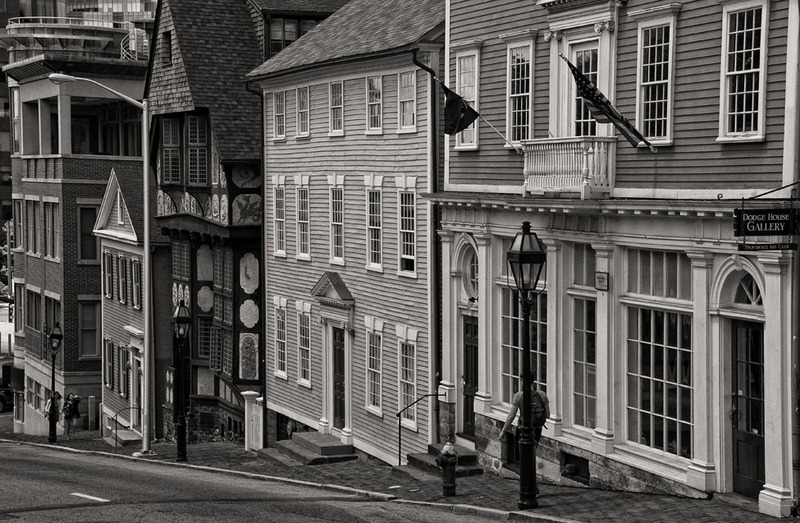 And yet, because of my ongoing “Rhode Island in Black and White” project, I wondered how such a monochrome version would look. Maybe the variety of shapes and designs would enable it to succeed. I tried four different versions, all with Nik Silver Efex Pro 2: three straightforward B&W and one sepia, since I definitely wanted a sepia in the mix. The three B&W versions all turned out to look remarkably alike–which, I think, shows that I had a certain vision for the image and ended up achieving it in three different ways. The one I’ve chosen is the one below, because it showed the most detail at one critical point. This was with the Fine Art preset, with Brightness, Contrast, and Structure adjusted to 0, 24, and 65 respectively. For the sepia version I went with Soft Sepia, again with the Nik software. Here I adjusted the settings to Brightness 0, Contrast -23, and Structure 56. Note that the default Structure setting for this preset is -35, so that’s quite an adjustment. The rationale: If you dial down such an important feature as the color in this image, you have to make the best use of the other characteristics; the “softness” of Soft Sepia wouldn’t work, and I had to maintain the structural details–the lines, patterns, designs. Here is the result. What do you think? The theme I’ve been using is clearly not working well for inserting multiple photos. You faithful readers deserve better. I’m going to invest in a special theme that better allows photos to be showcased, and you’ll get it for my next post. 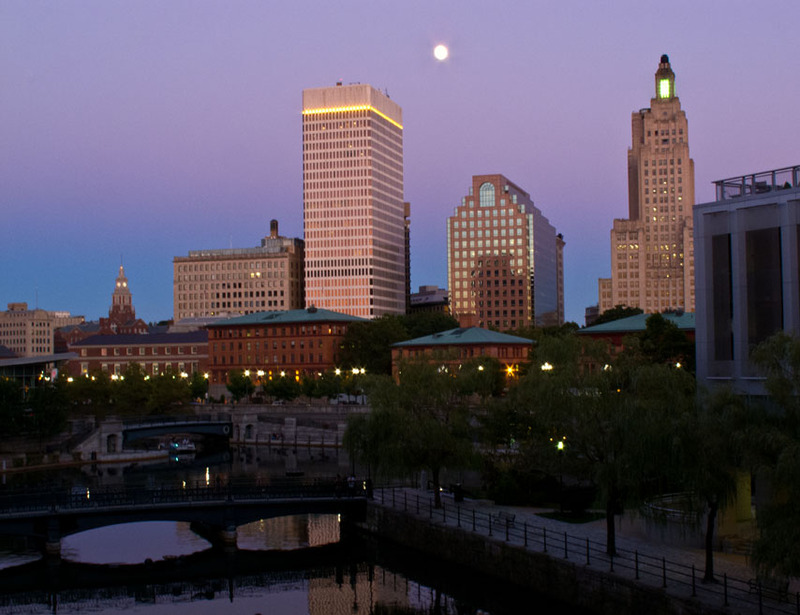 Meanwhile, to thank you for your patience, here’s my photo of the recent blue moon over downtown Providence, Rhode Island. 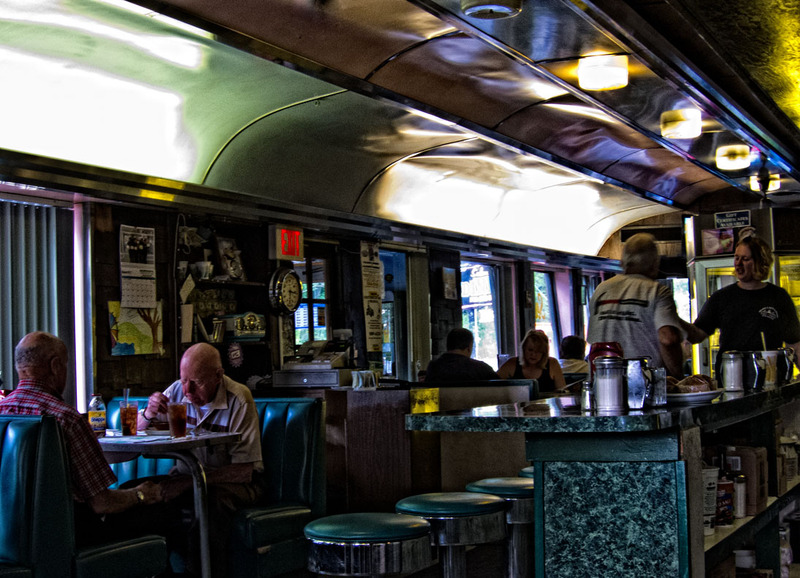 Diners are fun to photograph. I mean the ones with real local character, not those that tend all to look as if cut from the current trendy cloth for diner looks. 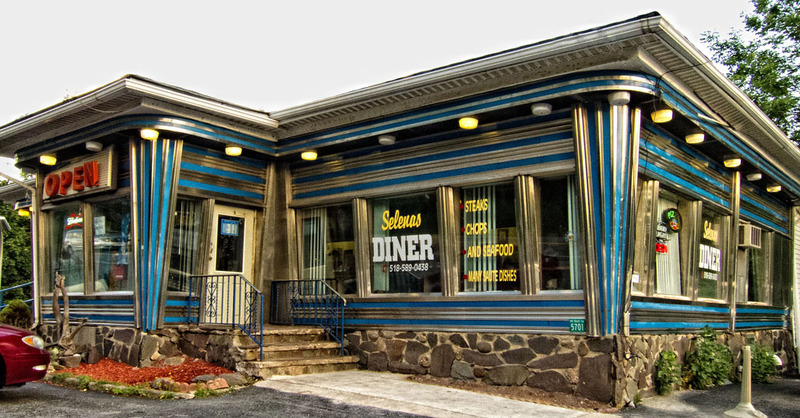 I had my eye on Selena’s Diner in the Catskill village of Haines Falls, New York for a while, and a few weeks ago, after leaving a reception for the Twilight Park Artists Show, where I had pictures on exhibit, I pulled in there quite on impulse to grab a light bite before the long drive through Kaaterskill Clove and down the Thruway. 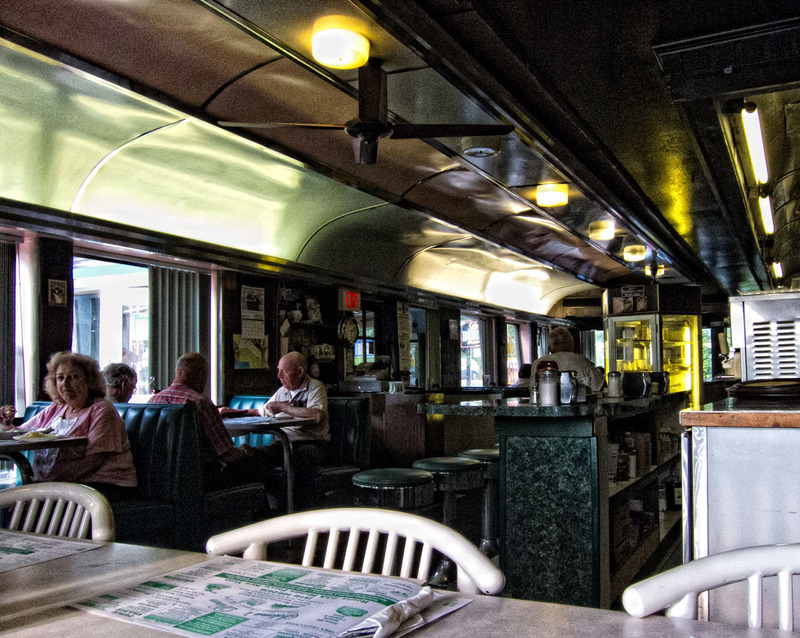 The timing couldn’t have been better; nor could the place where I chose to sit, because I was at one end of the oblong little building and the early evening sun was forming these long streaks of light that led my eye from my seat into and through the length of the diner. 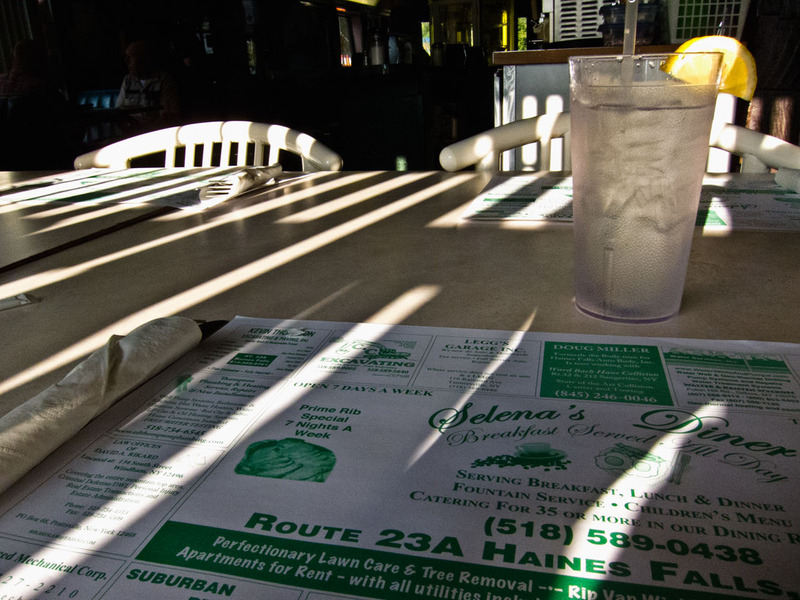 I had my discreet little Canon Powershot S95 with me and got several images. As I left, of course, I photographed the outside as well. Here is a selection of the images and how I processed them. I began with Raw processing, as always, and here was fairly generous with the Contrast and Clarity sliders because I wanted to accentuate those sunshine-painted patterns. In Photoshop I continued the processing with Nik Efex Pro’s ProContrast at 40%. I aimed to keep a reasonable unity of processing styles for this little series and was intending to use the Nik Tonal Contrast for them all, but it didn’t work for this one; this image needed a smoother look. Note how I deliberately included the placemat at the bottom of the picture to establish where this was! Tonal Contrast from Nik Efex Pro brought out the different textures in this picture. I used Highlights 24, Midtones 30, Shadows 60 (excellent for defining the areas that otherwise might literally remain “in the dark,” and Saturation 20. This one uses Nik Efex Pro’s Tonal Contrast with Highlights at 40, Midtones 50, and Shadow 62. Saturation 20. I never overdue saturation since I rather abhor that exaggerated eye-candy look so beloved of some.